To edit the schedule for Fixed Loans: Open the loan account > click on More - Edit Schedule > make the changes > Save Changes. Please note that you cannot increase the total interest, just decrease it. After making interest reduction changes on Fixed loans, the interest posted on the account will not match the interest rate at the product. The manual editing will override the automatically calculated interest. To edit the schedule for Dynamic Loans: Open the loan account > click on More - Edit Schedule > make the changes > Save Changes. Recalculate - allows you to preview the adjusted schedule before saving the changes. Save - will recalculate the schedule to reflect the changes and save it immediately (with no option to review before saving changes). In order to only view the schedule before saving it - the Recalculate function should be used. Principal can only be moved between the instalments, i.e. the total outstanding balance needs to be fully allocated at all times. It is therefore not possible to increase or reduce the total outstanding balance. For Equal Installment loans: Principal on the last installment is not editable. When the principal is edited, the total due amount on the previous installments will not be changed, and only the next installments after the edited one will have equal installments recalculated (based on the remaining principal balance and remaining number of installments, including installments with custom principal). Due dates in the Revolving Credit accounts are not always fixed, nor predefined for the full term of the loan at the moment when the contract is signed with the client. However, you can customize the schedule for Revolving Credit loan accounts to accommodate for such scenarios when the instalment due dates are aligned to the clients’ salary pay dates, which effectively means that they may fall on different days each month. After adding a new Revolving Credit loan account, you will have the option "Edit Schedule" under the "More" button, allowing you to edit the schedule while the account is in Partial Application, Pending Approval or Active (In Arrears, Locked included) states. You can add or delete instalments, however the delete functionality is only available for instalments that are manually added, it does not apply for instalments added by the system. When adding a new instalment, users can define the due date, while principal and interest due will be empty. They will be filled in when the instalment will become due. Adding new instalments before already paid instalments will not be possible. An empty instalment will appear by default. You will be allowed to add or delete instalments, with the same constraints as mentioned above. The instalments will be shown on the Schedule, even if they do not have any principal and interest allocated, with Pending state as default. Instalments will be added according to the "fixed days of month" setting on the account, if there's still principal balance to be allocated, after the last custom instalment due date. If a custom date instalment was added before or after the date defined on the product (fixed days of month), then Mambu will not add an additional instalment. The changes available will always depend on the product settings. 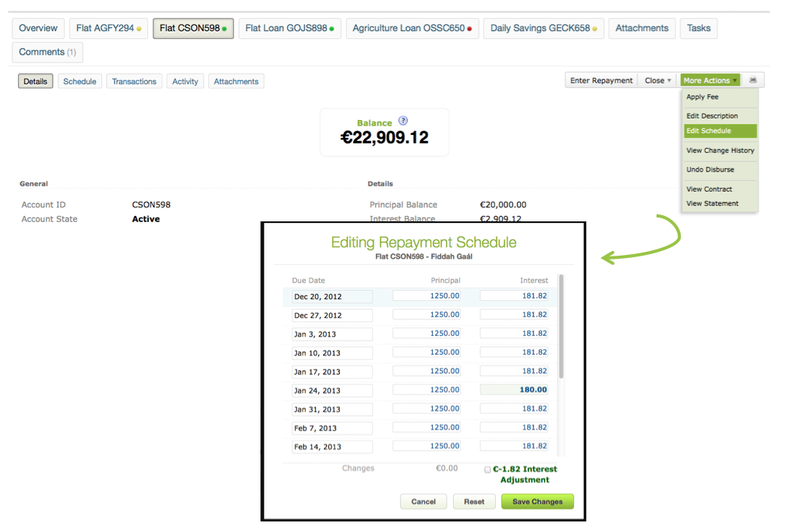 To be able to edit a repayment schedule, the user needs to have permission to "Edit Schedule"
Changes in the repayment schedule will be logged under Activities. Please note that for the following product settings: Declining Balance Dynamic Loans with Pre-Payments Recalculations methods set to either “No Recalculation” or “Recalculate the Schedule, Keep the Same Principal Amount”, if you click on CALCULATE SCHEDULE button under the Schedule Preview section, you will be able to edit/adjust the schedule directly, by changing the due dates, allocation of the principal, or adding and deleting installments.